i don't know what is happening but i this morning i woke up with the idea of eating a brik... a tunisian brik ! this is a tunisian food speciality, usually consumed on daily basis in Ramadan. 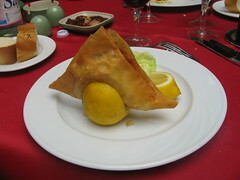 the brik's was originally a turkish speciality.but actually represent one of the symbols of the Tunisian food. try it and you will always remember it ! Prendre deux feuilles de brick (une seule casse !) et les mettres l'une sur l'autre dans une assiette à soupe. Mettre du thon émiété, des cornichons coupé en petites lamelles, casser deux oeufs, saler, poivrer. Refermer les feuilles de brick (gauche droite, puis haut et bas). Mettre à cuire dans une poele avec assez d'huile du coté de la fermeture. Variante : En fait vous pouvez mettre tout ce que vous voulez en plus des oeufs (fromage rapé, tomate, jambon, câpre, etc...). ellah yessel7ak ya zizou , du brik de bon matin!! !